Potter always saw glass as an experiential medium, and not dependent on a final product, she told the GLASS Quarterly Hot Sheet in a telephone conversation. She believes glass is about the creation and the fluidity of the material rather than the end point being the physical results of creation. “Glass is an experience, not an object. That philosophy informs everything,” she said. It is with this mindset that Potter was hired to be studio manager of the Chrysler Museum of Art in 2011 (after learning of the job posting via the Hot Sheet). 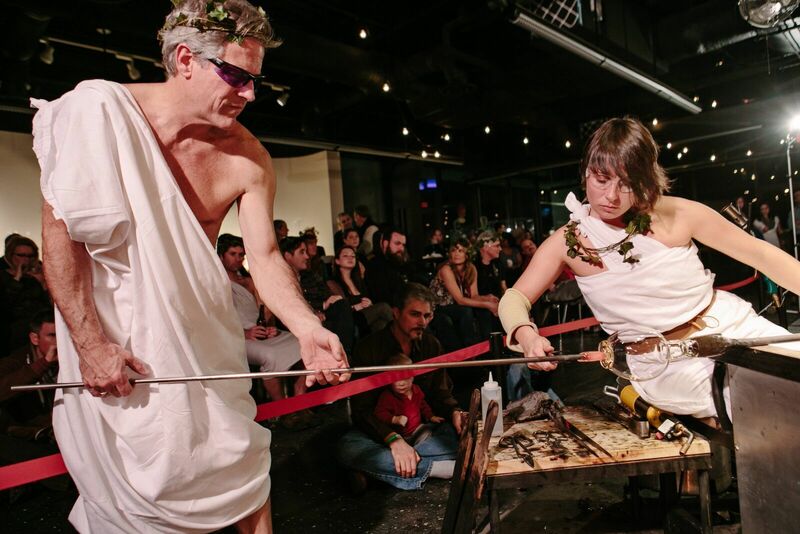 Her experience forming a glass performance troupe before earning her MFA at Rhode Island School of Design led Potter to make performance art a focus of the programming at the Chrysler glass studio. During her tenure, her title was expanded from glass studio manager with the added second title of "program director" as well as oversight of some 22 programs. Potter has also formed many partnerships with surrounding educational institutions and underserved youth programs to bring them into the Norfolk glass community. The development of the performance art studio attracted interest from the surrounding community and catalyzed the growth of what is now known as the Neon District in Norfolk, a vibrant art community. "Charlotte was instrumental in getting the program off the ground. It’s had a wonderful effect. Bringing the glass studio to the museum has diversified our audience," said Anne Corso, the Chrysler's' director of education and public programs. The Chrysler gave Potter plenty of room to bring her own vision to creating a performance art series. “There was a great deal of support here and a lot of interest and excitement," recalled Potter. "I was given great autonomy to learn and tons of good mentorship from people on the executive committee. I am thrilled with where the studio is right now. I think it is poised for success and it’s a really exciting role for someone to step into.” (Read more about Potter's work at the Chrysler in her profile feature article that ran in the Spring 2017 edition of GLASS [#146]). Potter’s greatest initial challenge was getting the public to conceptualize glass as the fluid medium she had always seen it as. She wanted audiences to be able to let go of the idea of the finished product and focus on creation, which means many works made during shows have been smashed during or after the performance. At first, audience members showed frustration when glass pieces were broken, but Potter worked hard to create the correct narrative that would guide viewers through the performance experience and help them become detached from the idea that the final product was important. Now, her performance-art series is widely recognized and hugely successful. One lesser-known aspect of Potter’s job was the mentorship program she created for artists who have recently completed their undergraduate degrees. She modeled the program after her experience at Wheaton Arts and Cultural Center working under Hank Adams. “I cherry-picked the best parts of that program but ours is more structured and has a definitive leave date. That’s been one of the most rewarding and least-seen parts of my job,” she said. Rough plans for a multimillion dollar studio expansion debuted at the GAS conference last month, and Potter hopes the opportunity to lead the fundraising and design in the next three to five years of expansion will excite a potential successor. She also hopes the studio will expand its partnerships to include military veterans, since Norfolk is home to a naval base. Potter is excited to turn her attention to her personal art, and work more on the performance aspect. “I’ve been supportive of performance artists for the past six years and I’m excited to get back to that in my own work,” she said. The Chrysler has not officially started the search for Potter's successor, but expects to be doing so by the end of summer. "New people bring new directions. We are excited to see what innovations will come," Corso said of the next glass studio manager.